Pope Francis doesn’t particularly like any of this, so has himself issued a decree: “A person who thinks only about building walls — wherever they may be — and not building bridges, is not Christian. This is not in the Gospel,” he pontificated. Pope Trump finds Pope Francis “a very political person“, and Pope Francis, draped in saintly white and denying that he is a very political person, intervenes directly and dramatically in the US presidential race and tells Roman Catholic Republicans not to vote for Pope Trump, for he is the anti-Christ. And so the Pope of Rome has excommunicated the Pope of Manhattan, and the Pope of Manhattan has responded in kind. Venom, mud and obloquy. But Pope Trump did most definitely say these things, of that there is no doubt, and so there is no benefit to be found in that granting of the benefit of any further doubt. 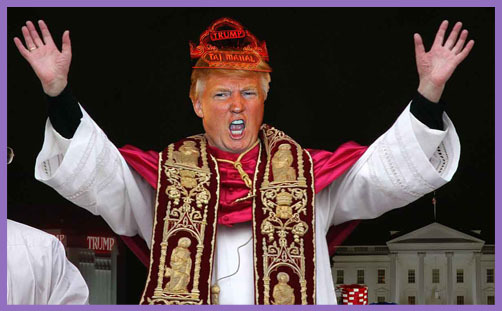 And so we are left with a papal decree that Donald Trump is not a Christian, which isn’t going to go down well in certain southern states where a presidential candidate’s Christian credentials are a matter of political salvation or damnation. But who is Pope Francis to judge whether a man is saved or not? Any why is the matter of walls and bridges the determining fruit of faith? Why is the wall-building presidential candidate not a Christian, while the abortion-advocating candidate escapes without censure? And what of the candidate who builds bridges to deception, error and idolatry? Clearly, not all bridge-building is beneficial, and one might expect one who styles himself ‘Pontifex’ — that is bridge — to understand that wall-building is sometimes a necessary strategy for survival. Whether in Rome or Manhattan, political popes do not tend to live up fortified towers or behind fortress walls for nothing: they have enemies — immigrants even — who seek to kill and destroy. You cannot be a bridge to a million immigrants who neither share nor respect your culture without profoundly changing your culture. Is Ted Cruz a Christian? Is Ben Carson? Is President Obama? Is the individualist? Is the corporatist? Is the Civil Rights leader? Is the gospel singer? Is the one who believes in God’s unmerited favour, or the one who believes in the Spirit-infused soul? Who can judge? Hymns and prayers do not sanctify: ‘Ye shall know them by their fruits. Do men gather grapes of thorns, or figs of thistles?‘ (Mt 7:16). More than a few Roman Catholics are sifting the papal wheat from the chaff, and find this particular Pontifex more than a little wanting. There is an undoubted moral obligation and scriptural exhortation to treat immigrants with compassion, for they are our brothers and sisters in the fellowship of humanity. But there is also a moral obligation upon our political leaders to govern wisely, justly and righteously for the common good; for peace and security. Pope Trump might offend with his venomous anti-immigrant rhetoric, but Pope Francis equally offends by looking into a man’s soul and determining that he is no Christian: ‘For all have sinned, and come short of the glory of God‘ (Rom 3:23). Politicians err, and so do popes. You may judge them by your pure apprehension of scriptural righteousness and spiritual discernment. But who made you pope?